Poet and student, Danielle Hall reading poem at the EBR Reading Room. We're still pushing with various forms of presentation in the EBR Reading Room. 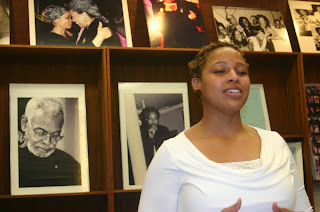 Today, one of our visitors, Danielle Hall, agreed to read one of her poems during her visit at our exhibit. I took out my audio recorder, and Danielle read her poem, "Lineage." OH-EMM-GEEE! It came out WAY better than I expected. I had a blast today and look forward to doing more with the Black Studies Program!! !